Once again one of our favorite television shows was cancelled. It almost seems like the networks are taking note of what we’re recording and hitting the delete button after just a season or two (or sometimes less). We joke about how we must be on the fringe of what mainstream viewers watch. Most of our favorites don’t air during the prime season, but in the off-season where networks test out their borderline shows. You think we would have learned by now. Legend of Sleepy Hollow made it through four seasons on FOX before finally getting the axe (pun intended) this past March. To be honest, this show had run its course and moving the story to Washington D.C. was a little unbelievable. If you’ve never watched, the first two seasons are certainly must-see TV and can be binged online. So why am I complaining to you about a TV series that can’t be watched any more? Because we’ve discovered what might be the next best thing – a brand new board game about the same theme! 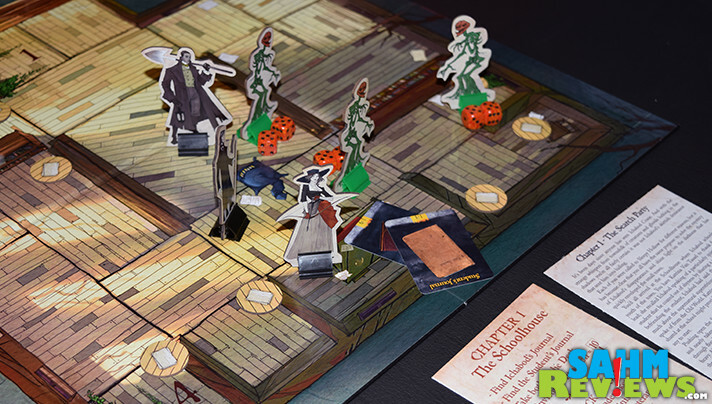 Legends of Sleepy Hollow is a new Kickstarter campaign by Greater Than Games that is our absolute favorite type of board game – cooperative. 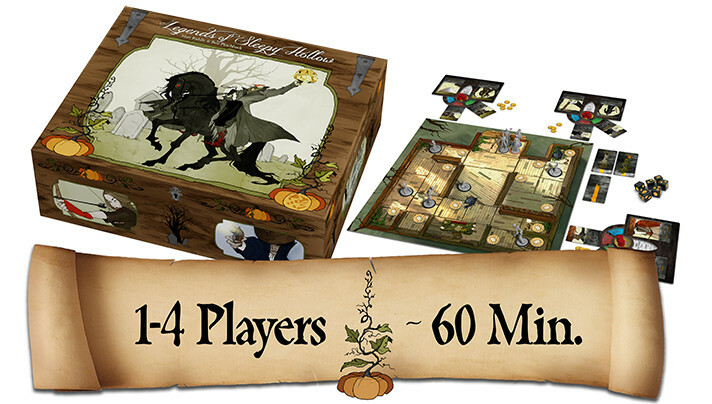 What’s cool about Legends of Sleepy Hollow is the story-telling aspect of each game. It reminds us of the individual shows of the TV series, each round (episode) having unique foes and challenges, culminating in a grand success or an epic failure. 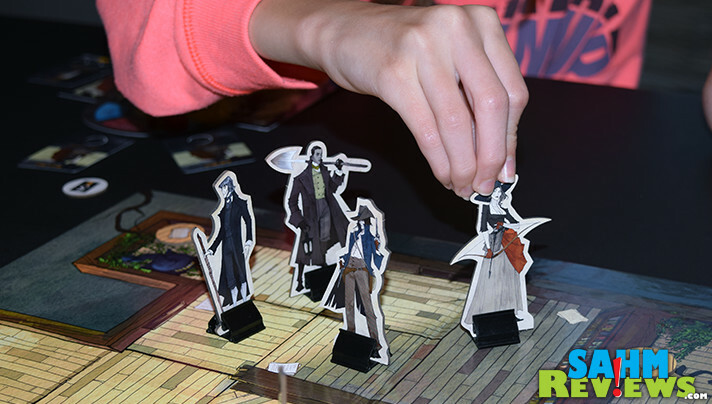 We had the fortunate opportunity to test out a prototype of the first chapter of Legends of Sleepy Hollow to get an idea of how the game is played and whether it is worth backing on Kickstarter for the full edition. 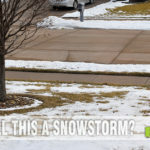 Spoiler alert – the answer is yes! Just like a good TV show, you don’t want to know any spoilers before getting the chance to view it yourself. We’ve taken extra precautions to try to avoid spoiling anything about the game that would ruin your experience. This is the type of game that introduces new things as the game goes along and if you’ve never played, you have no idea what’s around the next corner. 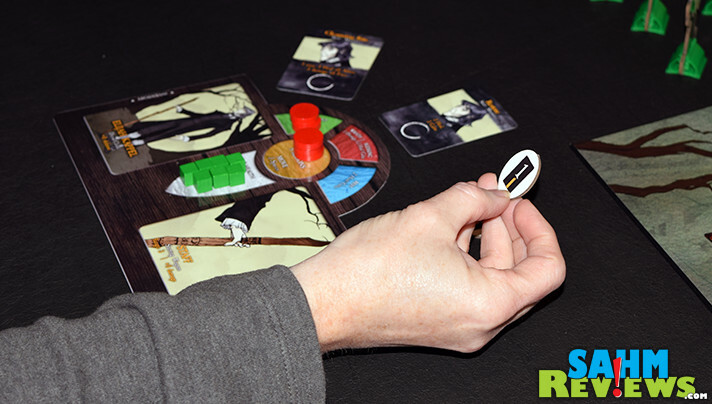 Our prototype version uses simple components in place of the deluxe pieces you’ll receive if you participate in the campaign. 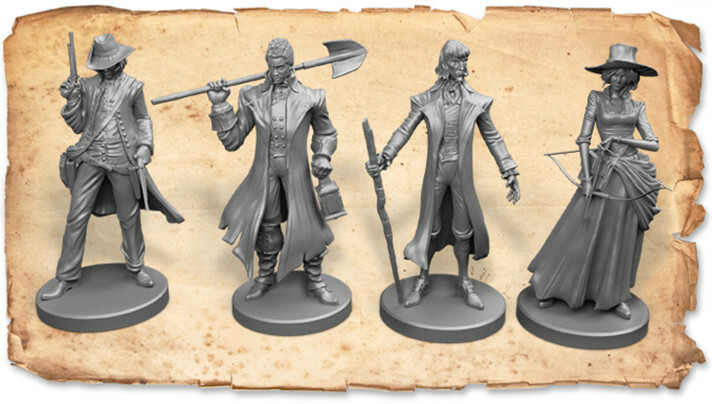 For instance, our characters are cardboard standees, while the final version of Legends of Sleepy Hollow will have beautifully sculpted plastic miniatures. 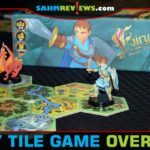 Wooden tokens will be replaced by elaborate plastic pieces and the laminated paper player boards will be beautifully printed on thick cardboard. As we’ve said many times, a game doesn’t have to be pretty to also be fun. Playing through this first chapter of Legends of Sleepy Hollow gave us just a taste of what to expect, and yes, we want more. 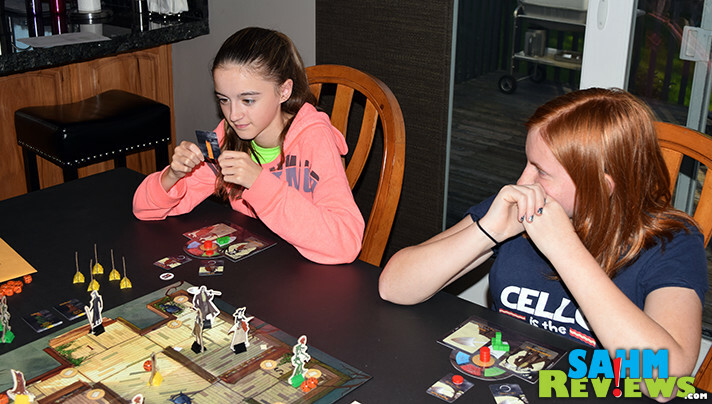 During the game we are trying to unfold the tale of the mysterious disappearance of Ichabod Crane through the eyes of four Tarrytown residents (each played by a different player) who all have strange ties to the supernatural. 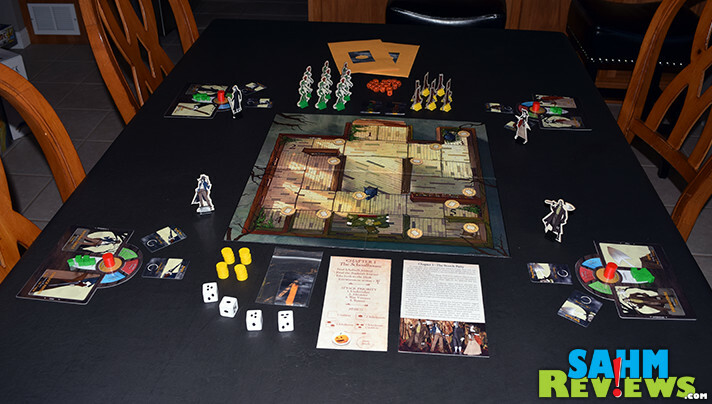 Each chapter has a detailed backstory and special goals which must be completed before even one player becomes incapacitated (dies), runs away from fear or the board is overrun with so many foes that you run out of pieces to add! Depending on your character, you’ll have a certain number of actions to take each round. These will vary from movement, resting, combat and more, and are limited in the number of times you can do them. Any time you are attacked by a foe, you will gain a fear token. These act as additional action tokens on subsequent turns, and because you cannot clear your board (reset) your tokens until you have spent them all, gaining additional actions is actually something you do not want. This is exactly the opposite of what you see in most games where additional actions means more turns (and thus more power). In fact, if at any time you collect ten fear tokens on your character, they run away in fear and the entire team loses! Each player has a “rest” ability that helps mitigate both fear and damage, and some can also help others recover. This is where the cooperative component really shines. Sure, you want to make your way through the map to accomplish your goal. But you cannot just run in and fight everything you see! You’ll need to carefully plan line-of-sight for both attacks and healing, action selection as well as being aware of new monsters coming your way. 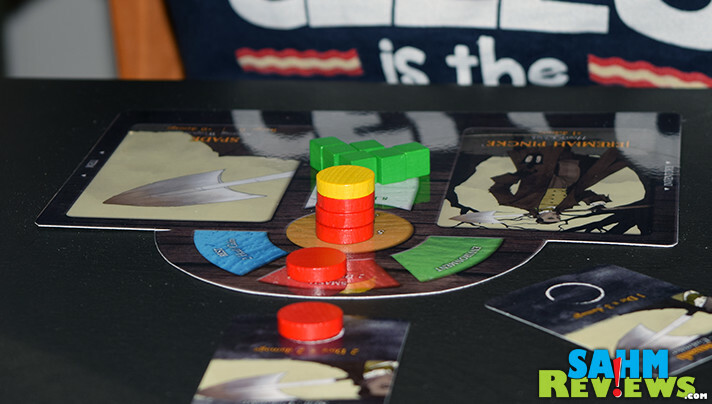 Each time the turns pass around the table, a marker shifts on your chapter card. Sometimes monsters simply move towards the closest enemy and attack if in range, other times new ones also spawn. Keep an eye on which stage you’re in since they also spawn in random places. You don’t want to be caught in a room when they pop up! Killing the monsters isn’t a one-time fight. Monsters have health too, tracked by dice in this prototype, but will have some sort of custom health ring underneath the miniature to help you track how much damage you’ve done. What you don’t vanquish, the next person can run in and hopefully finish the job. 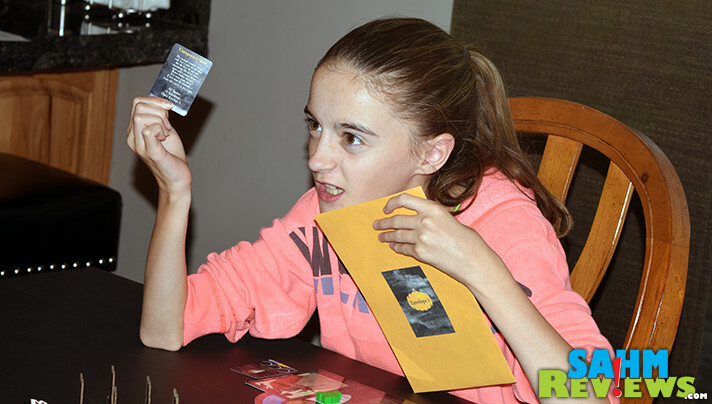 Along the way you will turn over “papers” found in rooms that will have you potentially drawing a card, revealing a twist in the story line. Are these good things that help you in your quest? 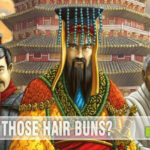 Are they something that will hinder you for the rest of the game? We’re not saying – you’ll have to find out for yourself! It is difficult to really show you more about Legends of Sleepy Hollow without spoiling the entire first chapter for you. Let us say that the game really shines in its storytelling, something we feel is missing in a lot of thematic games. Getting to play as the town Undertaker, Tanner, Dutch Reformed Minister or War Veteran, allows you to enter character since your abilities are closely tied to your persona’s occupation. We encourage you to check out the live Kickstarter and keep track of any stretch goals and other details that are divulged as the campaign progresses. In fact, all backers get an additional free game, a copy of the solo card game, Lost in the Woods, which will retail for $9.95 on its own! 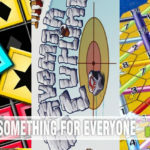 Greater Than Games is well-known for high-quality titles with fantastic components, all at a good price. Check out their Twitter and Facebook timelines for up-to-date information about this game and many others! Plus, the creators of Legends of Sleepy Hollow are no slouches either! They’re known for a number of popular game titles, including the very first in the E•G•G Series, Eggs & Empires! Heck, maybe one of the game’s chapters will solve the mystery of why the TV show was cancelled! sound so fun! I love board game like Risk so I might actually like this one! Might not be a game for my two years old to play but a great fun gamr night with friends! I’ve been looking for a new board game to play! Legends of Sleepy Hollow sounds perfect to play this time of the year! I love the story telling aspect of this particular game. How fun! My kiddos and I also got to visit Sunnyside (the home of Washington Irving) two years ago. I like that I could use this game to expand on that experience.